"Maurice Braun was born on October 1, 1877 in Nagy Bittse, which then, was within the boundaries of Hungary and now is a resort in Czechoslovakia. Hungarian by birth, at the age of four Maurice and the Braun family migrated to the United States and settled in New York City. As a young man Maurice Braun rejected a career as a jeweler and instead opted to become a painter. From 1897 to 1900 his professional studies took him to the National Academy of Fine Arts studying in the French academic tradition under Francis C. Jones, George W. Maynard and Edgar M. Ward. Following his training at the Academy, in 1901 Braun studied for one year with the famous American painter William Merritt Chase. After having been established in New York as a figure and portrait painter, Braun left for California in 1909 to escape the influence of his fellow artists. California's incredible landscape proved to be inspirational. Reveling in the color and forms of the region, with a strong sense of composition, he masterfully balanced the challenges of California's intense light and color. His landscapes reflect a deep respect and appreciation for nature. Captivated by San Diego and southern California throughout his career, Braun became an integral figure of the Southern California landscape school along with his contemporaries Charles Reiffel, Charles A. Fries, Leon Bonnet and Elliot Torrey. 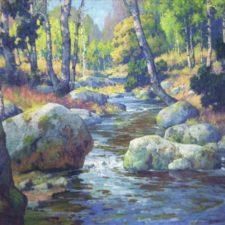 He was considered by many to be San Diego's most famous of early painters. He maintained studios in San Diego, California and Old Lyme, Connecticut. Maurice Braun won the Hallgarten Prize, National Academy of Design in 1900 and later the Gold Medal at the Panama-California Exposition, San Diego in 1915,1916. His paintings can be found in the Houston Museum, Los Angeles County Museum of Art, Laguna Beach Museum of Art and the San Diego Museum of Art. Maurice Braun died in his beloved city, San Diego, on November 7, 1941."